Like so many other popular Disney Junior TV shows, at The Party Warehouse we offer a range of Jake & The Neverland Pirates party goods. 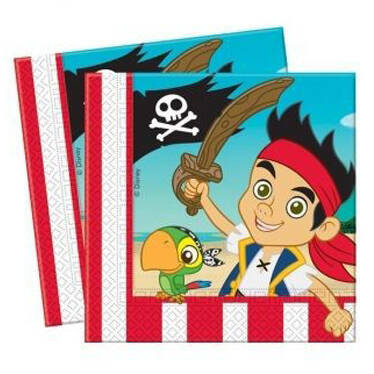 This selection of products is perfect for creating a kids birthday party that is all about the adventures of Jake's crew against the evil pirate Hook and his gang, and we are pleased to only offer branded merchandise that is official and authentic for your absolute peace of mind. Before the party has even started, your Jake-mad guests will love receiving their very own Jake & The Neverland Pirates party invitation - these come in a pack of 6 with colour-matched envelopes. A special touch can be added to the whole room with our colourful flag banner, and we also stock plenty of items to create an awesome pirate-themed table and buffet area. We have plates, cups and napkins so that everyone can have their own Jake-tastic place setting, and a matching table cover is also available to match the other accessories in this selection. Everyone loves a bit of pirate booty to take home with them, and fortunately all of your guests can carry it in a colourful loot bag complete with Jake and his discovered treasure chest. At The Party Warehouse we have a great deal of experience in providing everything that you need for a very special themed kids birthday party - we are a one-stop shop for the entire range of Jake & The Neverland Pirates official and branded party accessories.